This is a fun and dramatic Bible story to teach kids. 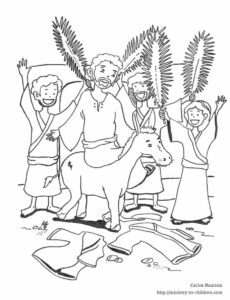 Download our Palm Sunday lesson below (the PDF includes skit, coloring pages and craft idea. The waiting was over – the promised King was finally coming into Jerusalem and the people crowded the streets to cheer his arrival. Often called the Triumphant Entry, this wave of popularity would be short lived. Yet in that special moment get a hint of the final return of Christ. This free Children’s Church lesson plan was first written for elementary aged students. It covers the story of Jesus on Palm Sunday. This material could also be used as the Bible lesson for children’s Sunday school. Be sure to consider your own ministry context and modify it as needed. Scripture: Matthew 21:1-11 or Luke 19:28-40 — This lesson plan follows the Matthew passage but you could easily take the same talking points and read from Luke, which is slightly shorter. After this lesson, the children will demonstrate an understanding of the story by discussing the main points of the story and then reenacting it. After this lesson, the children will demonstrate a deeper affection for Christ by offering him praise and worship. Bible: We include the text below but suggest you read directly from your Bible. Optional – Don’t miss the video story of Palm Sunday for Kids. or the children’s mini-book about Palm Sunday. You use those for an extra way to reinforce the lesson. Welcome Activity: Welcome activities are things to have out for the children to do as they are arriving for class. These activities will get them engaged as soon as they arrive and will help the transition from their parents. Have palm branch templates for the children to trace onto paper plates and then to color green and cut out. Open Conversation: Introduce the themes from this lesson through some informal questions and answers. You can modify these talking points as appropriate to get your class talking. What does a normal king look like? What is his job? What do you imagine a parade would look like for a king that everyone loved? Read Matthew 21:1-11 aloud to the children. Use an engaging style with dramatic voice. You will be repeating the lesson in smaller pieces as you explain in detail. Wow, this was a big parade – and Jesus deserved it. Remember how he had traveled all over Israel helping people, doing miracles, and telling them about God’s love. Now he was coming to the capitol, the most important city. This was something the Bible had been promising for hundreds of years. It was all finally coming together, and the people were going crazy like they had just won the super bowl. Jesus and His disciples were walking towards Jerusalem when Jesus stops them. He sends 2 disciples to get Him 2 donkeys. But He doesn’t say anything about paying for them. They are to go to the village and get a donkey and her colt. If there are any problems…they are just supposed to say that “the Lord needs them” and it will all be fine. But this wasn’t an accident. This was just what the Bible had promised for hundreds of years. The real king wasn’t going to be fancy, but ride into the city on a donkey … a donkey he had to borrow. ‘See, your king comes to you. Jesus was fulfilling prophecy. He was supposed to ride on a donkey’s colt – that means a young donkey. Can you imagine a big important king riding on a simple little donkey? What about the big army and the fancy horse? You see Jesus wasn’t a normal king trying to show he was important and force everyone to serve him. Jesus was the opposite: He came to show love and serve the people. The disciples did what they were told to do. They went and got the donkey and the colt. A big crowd was already showing up and covering the street with their coats and branches from the trees. Remember that they didn’t have paved roads back then – the roads were dirt. They were showing their respect to Jesus by covering the road so that He wouldn’t get dirty. They cheered for Jesus with words from the Bible. This was a big victory celebration, and everyone was excited to see what would happen next. Optional: Lead the children in rounds of cheering Hosanna and the other words from the passage. Divide the group and see who can cheer the best. Then to settle things down see who can cheer the softest. That was a big commotion! I bet the people in the city were wondering what was happening. Jesus made quite an entrance! People were trying to figure out who He was. Remember, there was no television back then. People had heard about Him, but they had never seen Him before. Notice – they didn’t say that He was the Son of God. They called Him a prophet. It was difficult for some of the people of Jesus’ time to realize that He was God and that He was going to save them. Even his disciples would be confused and abandon Jesus later that same week. The Bible says that Jesus will come again, but not in a parade on a donkey but in the clouds in full glory. Ask the children to describe what that might look like. Remind them that when Jesus comes again it will be to take his place as King of the world. This means we need to decide now if we will believe and follow Jesus. We need to be ready for his return. Bible Lesson Activities : Use the following activities to reinforce the learning goals. If time is short, move on to the evaluation portion of the lesson plan. Have the children brainstorm about ways that they could worship Jesus. Write them on the whiteboard. Do this a few times with the children. Make it fun for them to do the motions and say the words. Involving them in active learning is essential for memorization. Evaluation: Have the children discuss the main points of the story and then reenact it. I love this web page, I stumbled on it looking for a Sunday school lesson. I printed out the “Palm Sunday Lesson”. can’t wait to share it with the class….Thank you and God Bless. Tony Kummer (Editor) reviewed & updated this page on : April 14, 2019 at 6:42 pm. All our content is peer reviewed by our readers, simply leave a comment on any post suggest an update.